It is with great sadness that we announce the passing of our loving mother, grandmother, great grandmother and great great grandmother, Thelma Viola Scobey, on Tuesday, August 2nd, 2011 in Queens Manor, Liverpool at the age of 92 years. 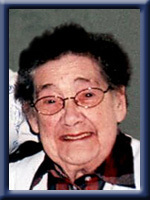 Born April 22nd, 1919, in Liverpool, she was a daughter of the late William and Sarah (Wolfe) Naugler. Thelma was a life member of the Ladies Auxiliary Mersey branch #38, Royal Canadian Legion, Liverpool and long time member of the Queens Manor Auxiliary and did pastoral care with the residents. She was an active member of the former Grace Anglican Church, Western Head and president of the ACW. She enjoyed crocheting, sewing, gardening handcrafts as well as cooking and baking. She will be fondly remembered as an outgoing, loving person who was hard working , very generous; always willing to help anyone in need. She was loved by all who knew her and will be greatly missed. She is survived by her daughter Virginia (Clifford “Bob”) Sanford of Liverpool; her son Reginald (Phyllis) Coolen of Mersey Point. Several grandchildren, great grandchildren and great great grandchildren. A step son William (Barbara) Scobey of Mersey Point. She was predeceased by her husband Edgar, son Gregory, step son Charles Scobey, sister Josephine and her husband Arthur Tarr, brothers Clarence and his wife Marion and Gordon and his wife Gladys. Our condolences to thelma’s family i’m sure she will be missed by her family and friends.She was a very pleasant lady. We are very sorry, to hear of your mother’s passing. She was a great lady and will be missed by family and friends. and everyone who knew her. God Bless you all. Our deepest sympathy to Thelma’s family. She was a good friend of Helen’s and will be missed by many who knew her. God bless you all. Reg, Phyllis, Ginny, Bob and Families: So sorry to hear of your mom’s passing. May all your happy memories comfort you at this sad time. My condolences to Thelma’s family. She was a wonderful person. I remember her visits to the shop where I worked. She was always so pleasant and loved to have a little chat. I hope the many happy memories you have will help you through the days to come. We fondly remember dear Thelma from our years in the Liverpool community from 1987 to 1996 and her special love for Grace Church. We were glad of the opportunity to visit with her in her little home in the town some years ago. One of her crochet pieces graces the table in front of our living room window. God rest her soul and may she live on in the memories of her loving family and friends. TO THELMA’S FAMILY -OUR DEEPEST TO ALL OF YOU AT THIS DIFFICULT TIME.SHE WAS ALWAYS A PLEASURE TO BE AROUND AND WAS ALWAYS WILLING TO HELP WHENEVER SHE COULD.SHE WILL BE MISSED BY ALL WHO KNEW HER. what a wonderful person she was and all the volunteer work she did there, especially working with her on the weekly bingos. I have fond memories of her and her handwork and treasure a few of her doilies. Our deepest condolences to all . Our thoughts are with you today and always. Wish we could be there. We will always carry with us all the memories of one strong, kind, loving, wonderful, woman. ” Nanny ” we will miss you sooooo much. With much love from David, Laura ,Rick , Chris, Joee ,Roxy & Riddik. We are so very sorry for your loss.We so much enjoyed her smiling face and were amazed by her generosity in volunteering whenever there was a need. She always had time for a chat and she will be sadly missed by many people. May your memories and families help you through this difficult time. So sorry for your loss, our thoughts and prayers will be with you all. We were sorry to hear about Thelma. Our thoughts and our prayers are with your family. I was very sorry to hear that Thelma has passed away. She was a lovely lady and will be missed by all who knew her. So sorry to hear of “Nanny’s” passing….she was such a kind and thoughtful lady…I remember lots of visits with her when Berta & I were young…and years later she always stopped to talk and find out how things were going….my thoughts and prayers are with you all and may your memories help to ease the pain during this sad time. Very sorry to hear of Aunt Thelma’s passing. What a wonderful lady she was! She was always a highlight visit when Uncle Carroll and I came to Queens. Her kind spirit will remain with us forever. Sorry to hear about your loss. Our thoughts and prayers go out to the family. In this time of saddened hearts,for the passing of such a dearly loving lady, we extend our deepest condolences. Your mother, grandmother and great grandmother was a lady loved by all that were fortunate enough to have known her. She will be deeply missed by all and her fond memories will last forever. So sorry to hear of her passing. I knew her through various functions with the Anglican Church. She was such a wonderful person to speak to. I am sure she will be missed by all who knew her. My prayers are with the family at this time of loss. God Bless you all. To,Thelma’s (Scobey,Coolen,&Naugler) families are deepest sympathy goes out to you all. Although I did not know Thelma very well,we had a few chats when I visited Mom at the Manor. She was Mom’s neighbour, there. Mom will miss her,as will her family and friends. Rest in Peace,Thelma. Our deepest sympathy to the family of Thelma. Our wonderful memories of her at the Manor will never be forgotten. Her great outlook on life was very infectious and she will be sadly missed. So sorry to hear of Thelma’s passing i loved her so very much she was a wonderful grandmother. I will cherish the memories I have of the times we spent together. My dear friend Thelma, You were one year less 6 days older when your grandmother as midwife helped to safely bring me into this world. Spiritually and mentally, we couldn’t have been closer. We have been close and special friends for 91 years. I have many good memories that I still cherish to this day. It has been 7 years since we last were together, but you have always been in my mind and thoughts. I send my love and prayers to you Thelma, and to your loving family. My deepest sympathy and love to all. We were very sorry to hear of your Mother’s passing. She was such a fine lady, always pleasant and thoughtfull to those she met. We met her often at the Queens Manor when she was a tireless volunteer, always bringing cheer to the residents. She will certainly be missed there and in the community she lived in all those years. Our sincere sympathy to all her family. To Themla’s family, she was a sweet lady, will miss our chats, she always had a smile, I will miss her,she was always happy to see and chat with me, my thoughts are with you at this sad time. I was very sorry to hear that Thelma had passed away, she was a very kind lady and will be missed by all. Special thoughts to all the family. Sincere sympathy from us in the loss of your mother, a wonderful lady who was loved by so many especially family members who seen to it that someone was at the Manor daily for a visit. Sorry to hear about the passing of your mother. Our thoughts and prayers are with you. May you only have happy memories to cherish. What memories you must have of wonderful years with Thelma in your life. I have known her only for a few short years, since my dog Phoebe and I have been visiting a Queen’s Manor. In those short years, we came to love Thelma and believe she truly enjoyed our visits. We would talk about the house, I live in the house she was born and raised in, and look over photographs. I would admire her crocheting and she would give Phoebe treats from her drawer. Thelma was like sunshine, bright and warm and inviting. Thanks to her loving family, Thelma’s room was full of flowers and cards and photographs, and Thelma was always looked lovely. I hope her family finds comfort in knowing other people will remember Thelma with joy and love in our hearts. I was saddened to read of Thelma’s passing. She was always a wonderful presence at Grace Church when I used to minister there. She will be greatly missed.